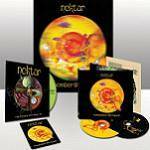 More information: A unique deluxe box edition of prog legends Nektar and their most critically acclaimed album Remember The Future - now with stunning 3D graphics! A specially created 3D rendering of this iconic album cover brings the image to life using lenticular printing giving it added depth and animation - this will be a collector’s item for years to come! Comes with a bonus disc of the famous Chipping Norton Studios session recorded live on March 27, 1974 PLUS a collectible patch and button!